“I am interested in the ‘too much’, doing too much, giving too much, putting too much of an effort into something. 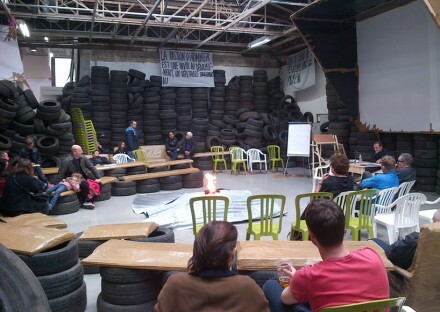 Wastefulness as a tool or a weapon’ says Thomas Hirschhorn about his practice. The Swiss-born artist’s new exhibition, Flame Èternelle in Palais de Tokyo in Paris is the indisputable proof of this effort of presenting the ‘too much’. Opposing the set codes of the museum as an institution, Hirschhorn has delivered works challenging the commodified notion of artworks and the dynamics of exhibition planning. Starting his career as a graphic artist in a Communist artist group during the 80’s, the artist later parted ways with the group to pursue a career delivering his widely recognized large scale installations. Hirschhorn’s mostly site-specific pieces, usually placed outside the gallery or the museum, suggest alternative environments for the viewers, combining architecture, poetry, philosophy and crafts. 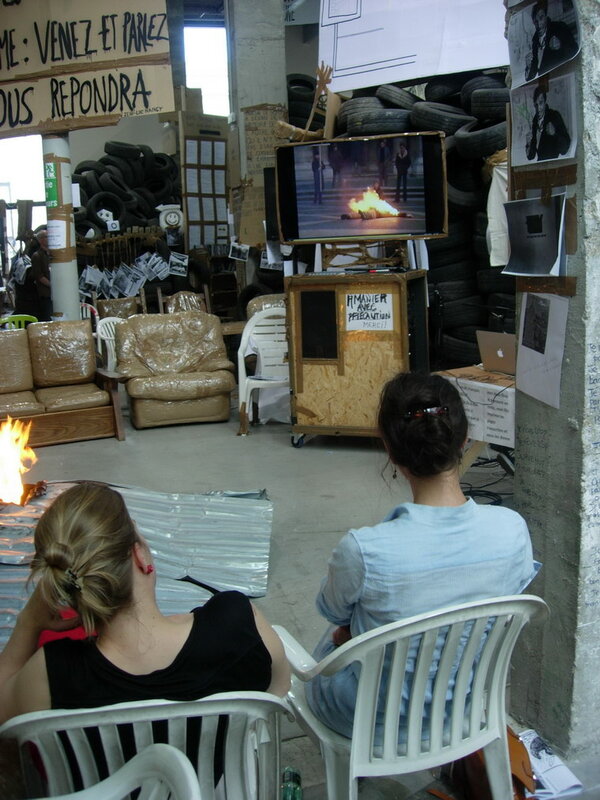 Everyday materials such as cardboard, styrofoam, foil, wood and utilitarian objects like chairs, tables and TV’s serve for the artist’s political statements, involving using materials that are universal, inclusive and free of surplus value. Ten years after 24H Foucault, a part Hirschhorn’s ongoing series of monuments dedicated to philosophers such as Spinoza, Gramsci and Bataille, the artist has returned to Paris with Flamme Èternelle. 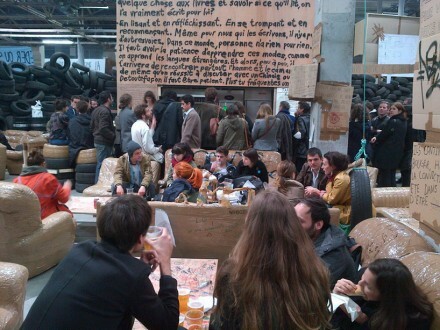 Built within Palais de Tokyo using an extensive range of materials including computers, sofas and tires, Hirschhorn’s new work goes beyond the limits of basic installation standards, expanding to a hub for the public inside an art institution while orchestrating a world of waste. At zero cost to enter, this hub serves as a center open for everyone from art-lovers to clueless onlookers to be a part of a social discourse. 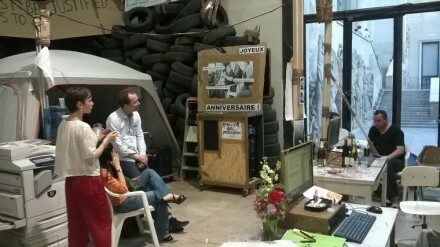 Functioning as a ‘space for encounters, dialogue and engagement’ in Hirschhorn’s own words, the space includes an inexpensive bar, many different sitting areas and a series of ongoing readings by poets, philosophers, teachers and authors for the public to enjoy through microphones broadcasting to the entire space. Emphasizing the notion of the work’s title, Hirschhorn describes the space as an eternal flame of thought, philosophy and creativity. Sitting on sofas covered with package tape and watching films on television screens while chatting with each others, the participants are welcome to discuss, argue and interact during their escape from the world outside in this discursive environment. 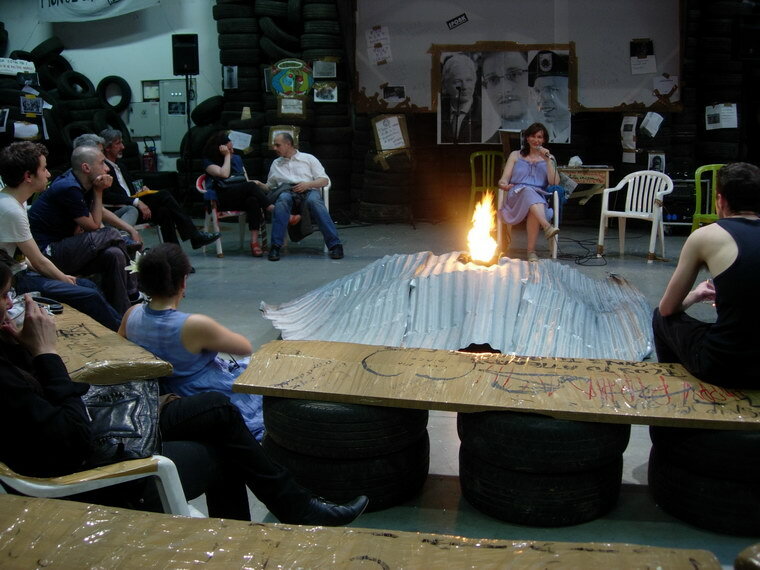 Hirschhorn, whose practice has always been associated with Relational Aesthetics due to its open-ended and socially engaged nature, achieves to construct a thought provoking seminal project, and can often be seen working inside the installation. 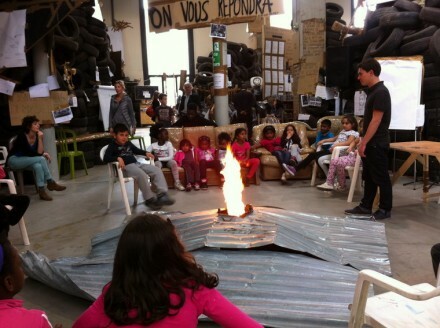 Thomas Hirschhorn: Flamme Èternelle is on View at Palais de Tokyo through June 23, 2014. This entry was posted on Saturday, June 21st, 2014 at 12:55 am	and is filed under Art News. You can follow any responses to this entry through the RSS 2.0 feed. You can leave a response, or trackback from your own site.